Wow… As usual it’s been too long between posts. There’s not a day goes by that I don’t think of (and usually jot down) at least one or two subjects to write on. Alas. 2015 didn’t include much space for writing. This year – 2016 – will be a year of writing, a year of training, a year of working, and a year of doing. This post is what has been rattling around in my mind as we’ve wrapped up the old year and moved into the new one. It’s probably of no significance to anyone other than myself, but if you’re inclined to do so, grab a cup of tea and come along for the ride. Looking back at the past two years – 2014 and 2015 – it’s been easy to feel like I didn’t accomplish much. But now I see they were a time for preparation. For laying groundwork. In 2014 Michael and I – well, mostly our very skillful contractor, Randy Metevier – renovated our 1960s house. I did most of the planning, purchasing, and scheduling, and some of the work, including refinishing the kitchen cabinets, painting a full-room mural, and planting a new garden area. Everything from the plaster inward was redone, right down to the wood paneling, the 30-year-old salmon-orange carpeting, and the poorly-designed room layouts that we couldn’t use well, and didn’t really enjoy. Now our house supports us, instead of being a constant source of irritation. In 2014 I trained for almost the whole year, along with my friend and dojomate, David, in preparation for our shodan exams. We worked hard, had fun, and learned a lot about Aikido and ourselves. I continued assisting in the kids’ classes at the dojo, and training almost daily. Here and there I also worked on a couple of books, which are waiting for me to get back to them. That year I studied for, and earned my certification as a Group Fitness Instructor – physically active, sociable work to balance out my sedentary, solitary writing. I worked on building that business, creating the branding, all the online assets, networking and advertising… the usual startup work. I also did tons of learning, reading, listening, and some writing, immersing myself in the fitness profession. 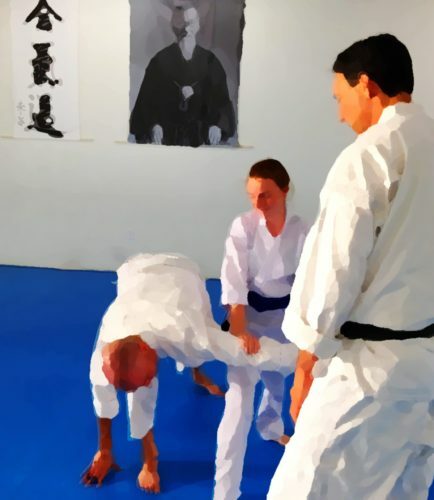 In February 2015 our dojo produced the first Joshua Tree Evolutionary Aikido Retreat, a major international, live-in, 4-day event 3 hours from San Diego. It went beautifully, and we’re offering it again this year. I couldn’t make it to the O Sensei Revisited retreat at Occidental, but did get to the Aiki Retreat in Feather River. I continued training almost daily, and assisting in the children’s programs. During 2015 I also had the opportunity to lead occasional adult classes at the dojo, which I enjoyed, and look forward to continuing in 2016. In addition to Aikido, in January 2015 (after I had my shodan exam safely behind me) I also started training with a strength coach. Deadlifts, presses, rows, squats, chin-ups… It’s been fun and interesting, and I feel more solid and confident, especially when falling and rolling. Over the summer of 2015 I led large group fitness classes (mostly for seniors), and discovered that while it is important and rewarding work with great people, it is also not a viable way to earn a living. One notch above volunteer work, pay-wise. I also was reminded that I don’t do mornings. No more 8 a.m. classes for me! An important lesson. Thankfully they were short-term gigs, filling in for instructors who were away for the summer months, so that spared me the awkwardness of quitting. In the fall I turned my focus to working with small groups and individuals. I studied more, and more intensively, this time to be a Certified Personal Trainer. I rebranded the business (FitCoachLinda.com), reworked all the assets, more networking and advertising… I established relationships with facilities where I can train clients and hold workshops. I learned more, read more, and listened more, too. I’m loving audiobooks, because I can easily “read” a book several times through over the course of a year. While I was in the right mindset to work on websites I also totally redid this one (see my earlier post), so things are easier to find and read, and it will be more useful and enjoyable to more people. During 2015 I got bogged down in some health issues, too – all resolved, happily. A particularly stressed-out day had me holding my breath periodically, and that triggered supraventricular tachicardia, where one’s heart rate can shoot up suddenly with very little provocation. Turns out I can hit 230 beats per minute just walking from my desk to the kitchen! I’ll write more about that another time, but the bottom line is that it’s relatively harmless, just disconcerting, and is well controlled by a mild drug (beta blocker) that costs $2.89 for a two-month supply. But it was an exciting few months of urgent care visits, cardiologists, heart monitors, conducting fitness classes in this state, and a few times sitting out classes wondering if I’d ever be able to train again – that was the worst part. That little cardiac adventure, plus some feedback from a mentor (“Hey, you’re not breathing! I can’t believe I never noticed that before!”) during one of my earlier shodan exam run-throughs led me to the discovery that I just don’t breathe sometimes. Not-breathing is bad thing, as it turns out. Long story short – pulmonoligist, sleep testing, and finally an APAP machine (like CPAP, but not continuous – it adjusts), plus being mindful of staying relaxed and breathing freely during waking hours, which is harder than you might think. I thought I had been sleeping OK before, but now I feel sharper, think more clearly and creatively, am more productive, and have more energy during the day. Still not a morning person, though! And as if that weren’t enough, I also managed to get flattened by a case of giardiasis – the sickness caused by the microscopic parasite giardia. I recommend that you not try this yourself. It’s miserable, can kill you, and can leave you permanently messed up. And no, I don’t know how I got it, in spite of going over the preceding 45 days of activities and foods with the very nice lady, Peaches, from the County Health Department. Could be anything from eating salad bars in the Sierras to the fresh cilantro dressing I’d recently discovered at the market. The worst part was the fatigue, which lasted well past actually being “over” the infection. I’m sure you’ve seen very elderly people who doze off during meals or conversations. Yeah, that. If I were moving I could keep moving (for a while). If I sat still I was out like a light. I had no energy. I would sleep 10 hours, teach two hours of classes, nap for 4 hours, train at the dojo, and crash again for the night. Absolutely exhausted. That can linger for months or even years. I’m delighted to report that I got away with just a couple of months, and seem to be fine now. Miserable stuff. At the end of 2015 I pulled together the last details required to begin taking on personal training clients. I determined rates and billing policies, created contracts and exercise programming forms, and designed systems for tracking clients’ progress. 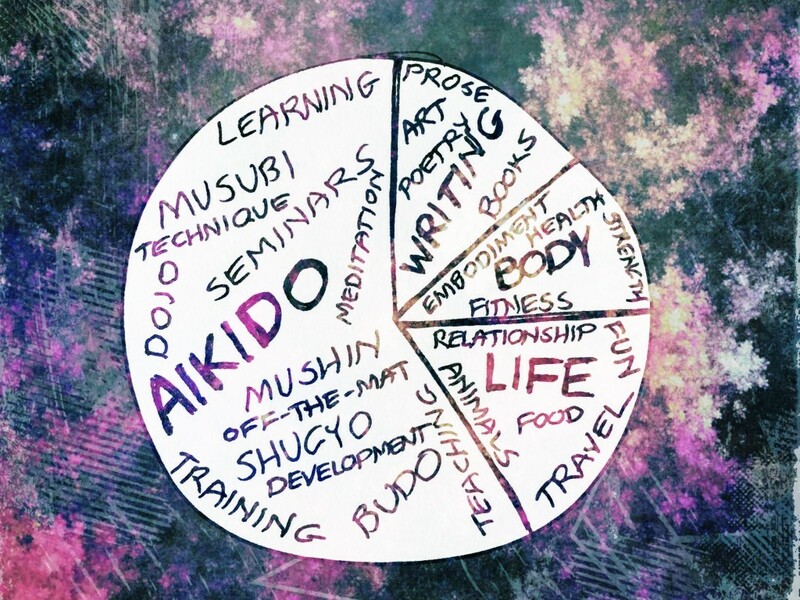 I planned a client training schedule that flows right around all the classes at the dojo, leaves useful spans of uninterrupted time for writing, and does not include being anywhere before noon. That about covers it. Time to settle in, dig down, and get to work! Thanks for hanging out with me all this time. I hope you have a brilliant year.